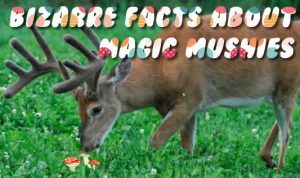 Bizarre facts about magic mushies. Magic mushrooms can pop anywhere in the world. Where they were once used for shamanic, religious and healing ceremonies by native peoples, today they are sought after for their mind-altering effects. There are more than 200 species of mushrooms you can classify as magic found in most countries. Meaning the people of the world have access to species that produce mind altering effects. In only two countries in the world is it fully legal to grow and be in the possession of magic mushrooms – Czech Republic and Spain. Magic mushrooms are not addictive in themselves though people can become dependent on them. Research into psilocybin at John Hopkins University shows psilocybin can help to break nicotine addiction. Research by others show psilocybin is useful for treating headaches, anxiety and obsessive-compulsive disorder. Did you know that? Reindeer enjoy feasting on magic mushrooms in the wild. WoW … no wonder they can pull Santa’s sleigh through the sky. Tripping on mushrooms is as old as time. Central American native people used them religious and shamanistic ceremonies. A theory by anthropologist John Rush is that Father Christmas was born from magic mushrooms. The story goes that Siberian shamans would give magic mushies to the tribesmen in December every year. And, because the snow was so deep they had to climb down the chimney to access the building to get them. The magic mushroom of the area, Amanita muscaria, is red with white spots. And, the shamans spirit animal is the reindeer. Now you know. Santa was born out of a magic mushie trip. Read more bizarre facts about magic mushies and how Christmas stockings were invented. it’s an interesting read at the Shroom Beer website. A theory by American philosopher Terrence McKenna says that magic mushrooms were part of the evolution of the world’s people. He believes that eating the gold tops (these are usually found growing from cow dung), helped the men become better hunters. So, now we know, gold tops boost your manhood. Or, do they really? 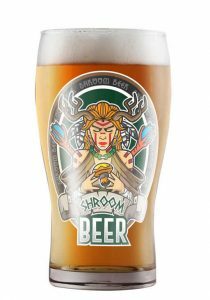 The Best Magic Mushroom Brew is infused with magic mushrooms, not brewed with shroomies. Boiling the wort mixed with mushies will boil away all its psilocybin, rendering the shroom brew trip-less. I had no idea the history behind shrooms, very cool read mate.